The HL Series HL-703 High-Load Stacking Container is a heavy-duty, stacking tote / container for high-value OEM parts. 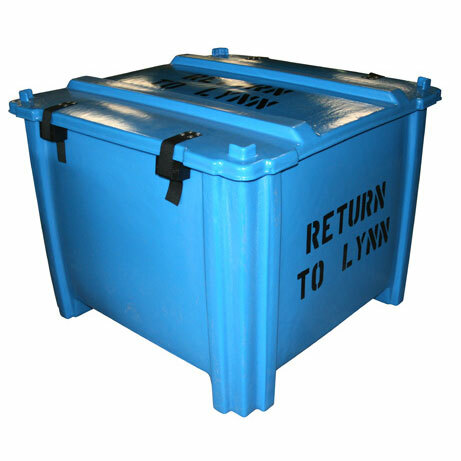 Ideal for storage and transport of special and custom parts. This design offers a lifetime of protected transport and storage for critical and high‐value components. Unifuse offers fabrication of this style to almost any specified size. Industrial‐duty seamless polyethylene construction. Positioning and cushion inserts can also be molded to fit inside the container to cradle valuable components. Foam sourcing services are also available. Will not rust, dent, chip or corrode and is resistant to most corrosive agents. Value added options include lids, branding, custom colors and attachments. Outer Dimensions (OD) (LxWxH) 43.75 x 43.75 x 22.5"
Inner Dimensions (ID) (LxWxH) 40 x 40 x 18"